"Several hundred" people in the UK are involved in illegal dog fighting, the Royal Society for the Protection of Animals (RSPCA) has said. The warning follows a BBC investigation that uncovered a network of criminal gangs who supply illegal pit bull terriers for fighting. The RSPCA said the popularity of dog fighting had been on the rise since 2000, following a lull in the 1990s. Betting large sums of money on fights could partly explain the increase. 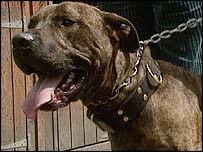 Pit bulls have been banned in the UK since 1991 and dog fighting has been illegal since the 19th Century. An undercover BBC Panorama team found that the dogs are brought into the country from other European countries using false documents. The gangs breed, train, and fight the unregistered pit bulls. Dog fighting expert chief inspector Mike Butcher of the RSPCA's Special Operations Unit, said the nature of dog fighting in the UK had changed in recent years. "The old-style dog fighters of the 1970s and 1980s would train their dogs as you would a prize-fighter, using treadmills and hanging tyres to prepare them for a fight," he said. "The fights would be in a regulation-sized pit with fixed rules and a referee, and would be stopped when one of the dogs had clearly won. "Owners would treat injuries to their own dogs with veterinary kits, and winning dogs would attain 'champion' status, which would give them greater value for breeding purposes. "Betting didn't really play a major part in these fights, it was more about the prestige. "Whichever way it's done, dog fighting is an abhorrent, cruel activity which is barbaric and sickening to any right-minded member of the public." Mr Butcher said the organisation had also noticed an increase in organised dog fighting. "The style of dog fighting we are now coming across seems to have evolved from urban street-fighting - young lads with their tough-looking terrier type dogs meeting others and 'rolling' them in parks. "This seems to be increasing across the country, and now seems to be becoming more organised, with pre-arranged fights indoors. But the emphasis appears to be more on betting and fighting the dogs to the death." The undercover Panorama team managed to gain access to one of Northern Ireland's biggest gangs - the Farmers Boys - who sell the dogs to people living in UK cities like Glasgow, Edinburgh, Manchester, Liverpool, London. BBC reporter Mandy McAuley, who was part of the undercover team, said the gangs took advantage of the fact Northern Ireland has a "soft" border with the Republic of Ireland, where it is not illegal to own a pit bull. They can bring in dogs from other countries to Dublin, by plane, then drive them up into Northern Ireland, where they can be easily ferried to the UK. MEP Jim Allister has called for tighter controls on dog movements throughout Europe following the BBC investigation. He said: "Following the disturbing expose of dog-fighting on the BBC, I intend, in view of the pan-European dimension and the misdescriptions in EU dog passports, to raise this issue through parliamentary questions in the European Parliament. "This barbaric practice must be stopped and European co-operation has a role to play in this regard."